Hello lovely Friends! 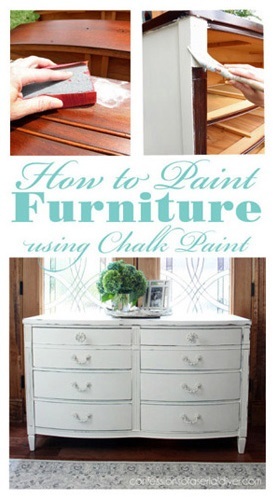 I get a LOT of questions about painting furniture. 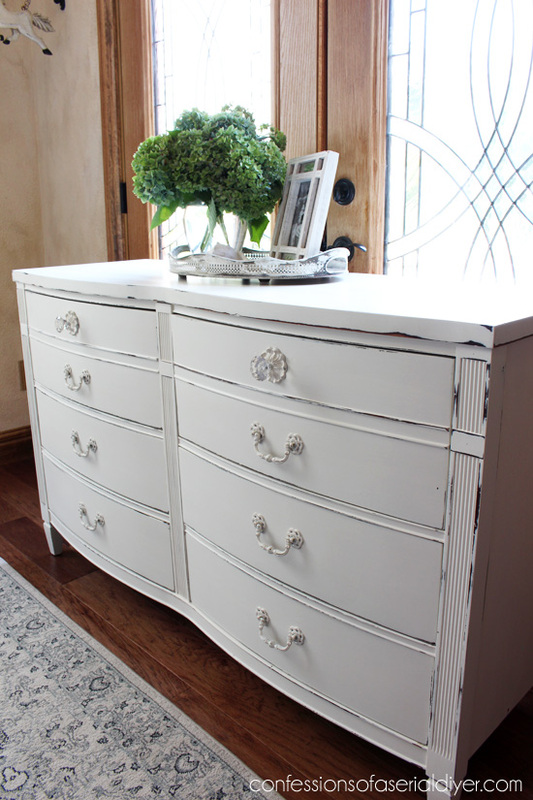 I am always more than happy to answer any questions that come my way, but I thought it was time I put together one helpful post sharing the start-to-finish process of what I do when painting a piece of furniture. That way I can refer any questions to the post, and it can easily be pinned for future reference. I had plans to share that today, but as I was editing photos (I took a ton of pics! ), I realized I had way too many photos to share the process and the pretty after photos for one post. So today I am sharing the before and afters, and in my next post, I’ll share the complete step-by-step. 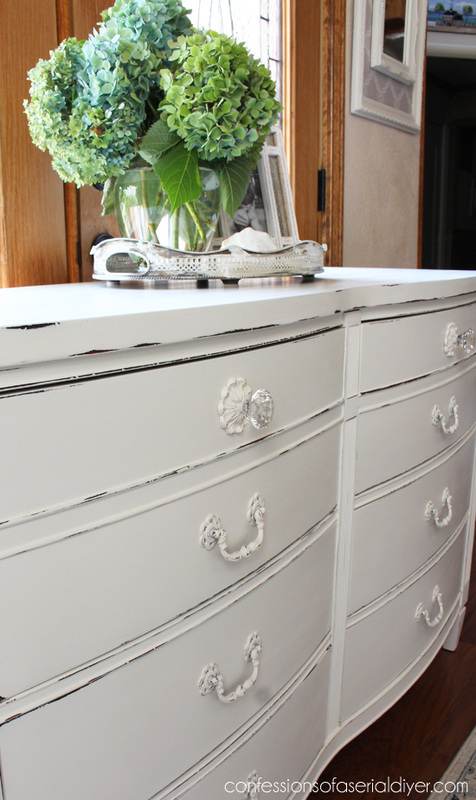 For my model for the big tutorial, I chose this gorgeous dresser I found at a yard sale a couple of weekends ago for get this…$40!!! She had a few scratches and dings here and there and was missing a handle, but overall she was in great shape. *Disclaimer* This post may not be appropriate for anyone opposed to painting perfectly good wood, so turn back now or look away…far far away. Ok the rest of you…here ya go! Ain’t she perty? 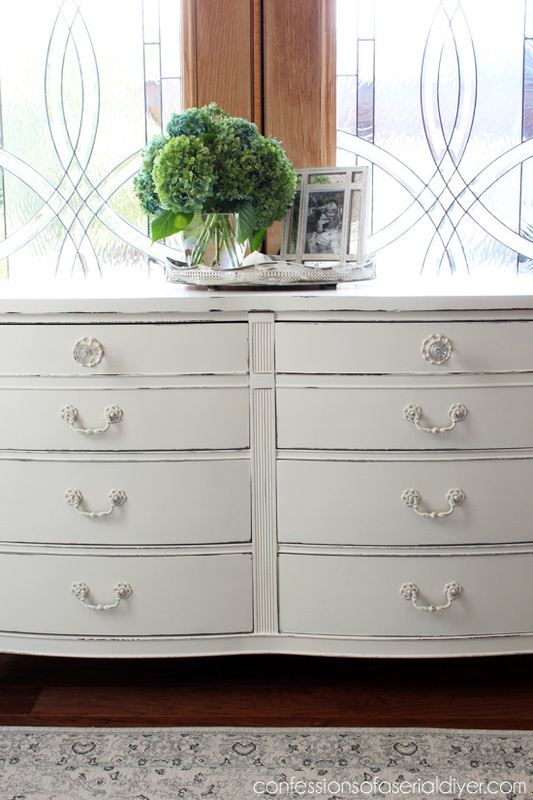 This style was perfect for a simple shabby chic makeover. I also kept it simple for my tutorial. The rest are the pretty originals. 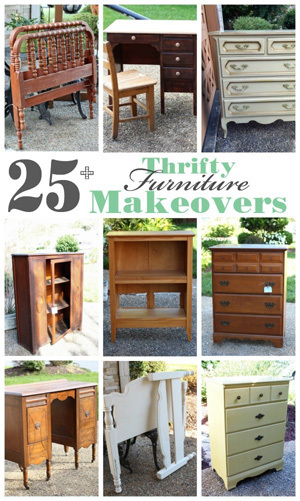 They all got a couple of coats of Rustoleum’s heirloom white spray paint and a little sanding. 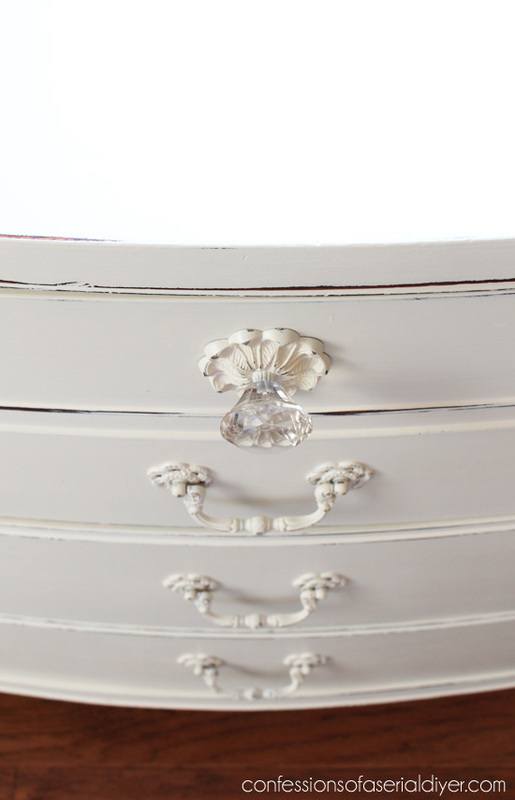 I love how the glass knobs add a bit of sparkle and femininity though. I love the lines on pieces like this, perfect for this style of makeover. 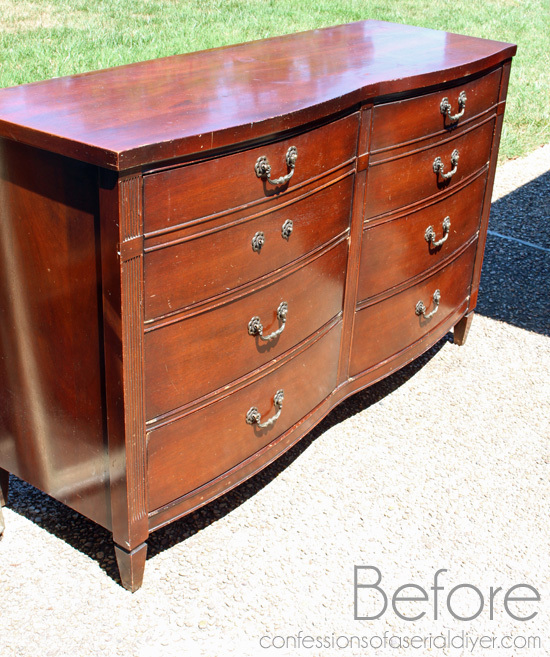 This also came with a mirror, but it was a huge rectangle and definitely didn’t match the pretty curves of this dresser. My favorite might be the drawers…I couldn’t find enough of any one paper at Michaels to line the drawers, so I chose three! Sometimes my favorite makeovers are the simplest ones. I’ll be back very soon with a complete step-by-step on how I painted this lovely piece! I thought the same as you in using knobs. 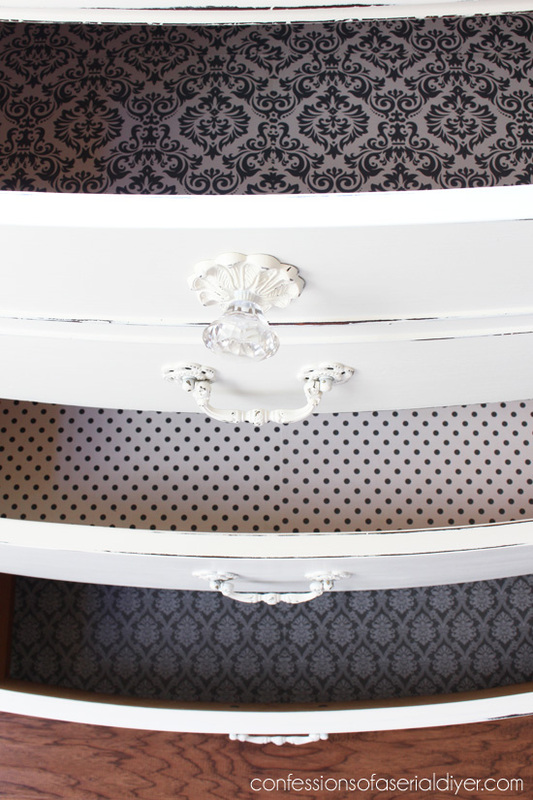 When I spotted that one handle missing; I thought, ‘why not move the top handle down and just add knobs to the top 2 drawers. 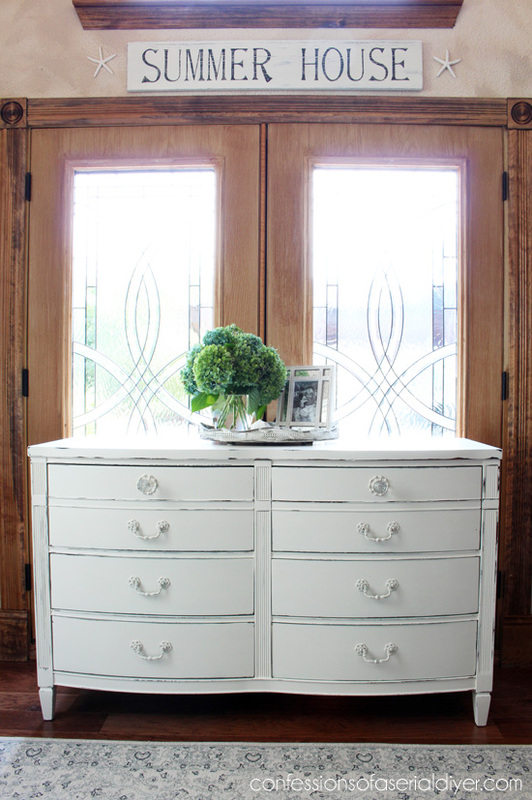 '( noticed how deep the top drawers are) :} Never thought of the glass knobs tho but sure do like it. Like choice of the drawer liners as well. Have a wonderful and enjoyable week end. I LOVE IT AND ALSO THE INTERIOR LINING. Lovely! White brightens up this piece and gives it what I think is a romantic look. I like the new knobs that you chose for the top two drawers. Pretty makeover! Looks amazing! 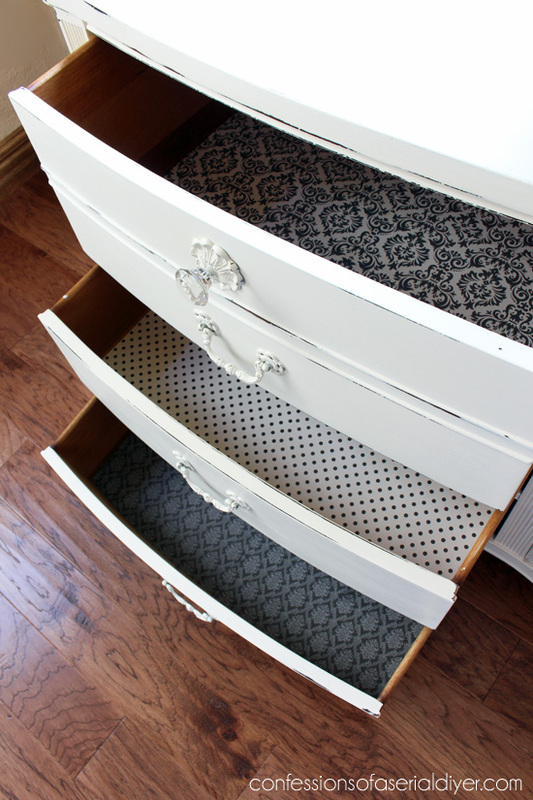 Love the drawer liners too! 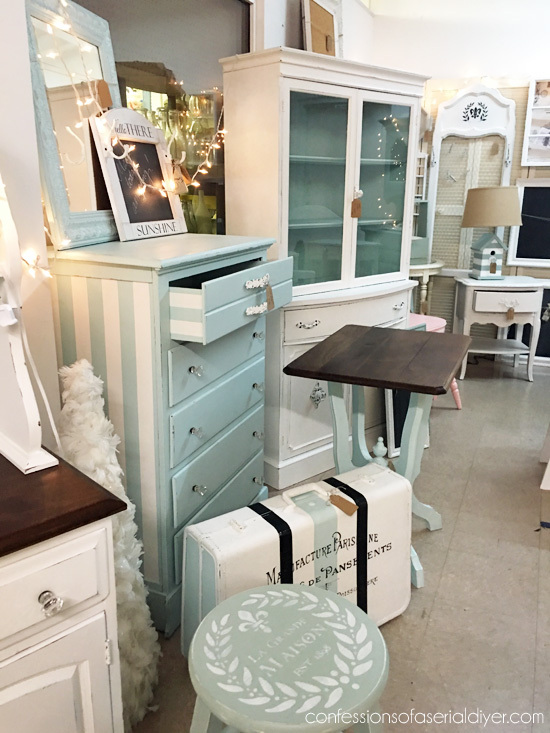 Christy, this bureau is gorgeous! I love the color and the new drawer pulls. Just the lovely accent of bling to bring out her personality. Thank you for the inspiration! Completely adorable! 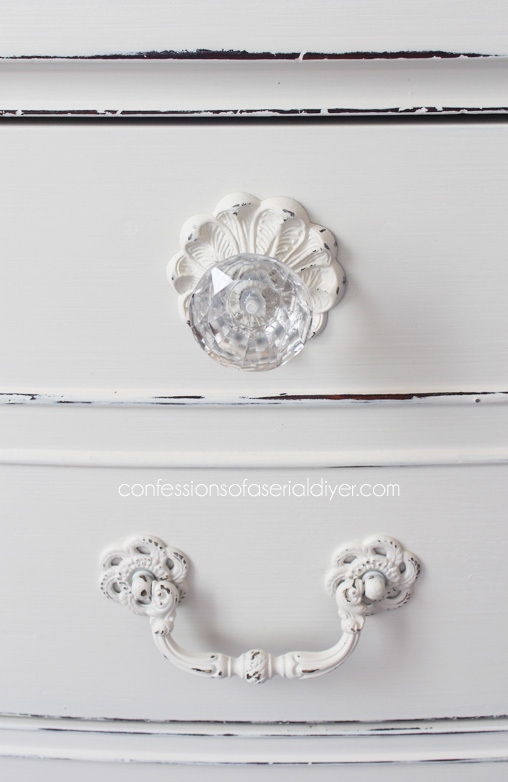 Love, love, love the drawer liners and knobs! Can’t wait to see the step by step tutorial! Love your imagination and resolution to solve a “problem” ( I mean with the missing handle), one question, are these knobs joined to that beautiful back or do you buy it separately? 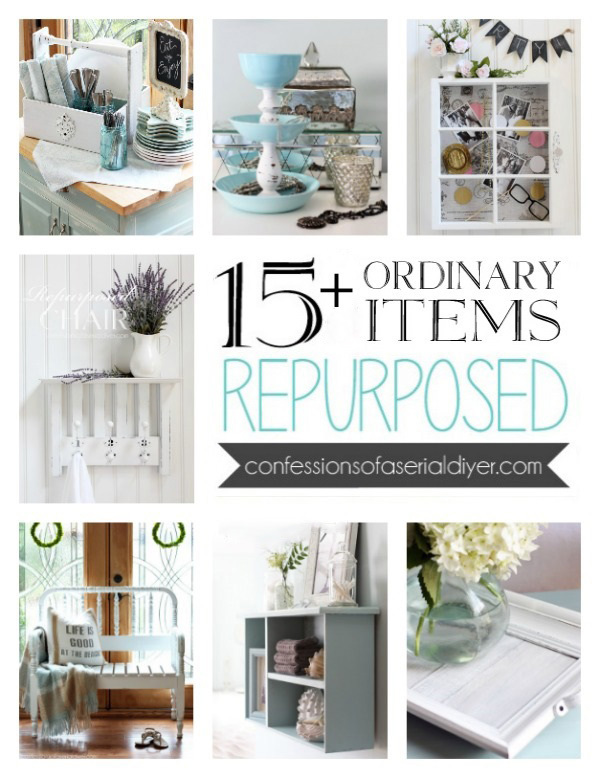 …( I remember also the same filigran back in the post reclaimed wood organizer…. ) I dont find here those kind of ornamental…. How do you fill the holes from the old hardware? I love the mismatching paper! Perfect! And white is always classic!! Love it. I’m in the middle of painting a perfectly good wood secretary today too!!! I may have to use that disclaimer, lol. 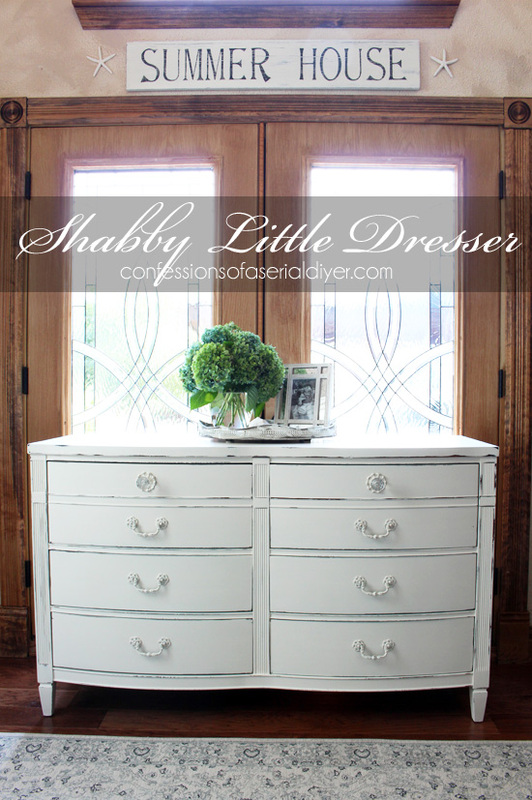 Oh my that gorgeous painted hardware with the glass knobs and floral back plate are the pearls on the little black dress and the gorgeous black & white papers, the fancy lingerie. Very nice Christy! I love the drawer lining paper! What a great idea! Especially when the inside isn’t quite so pretty! Can’t wait for the demo! Beautiful work Christy!!!! Well done lady! Thanks so much, Becky! 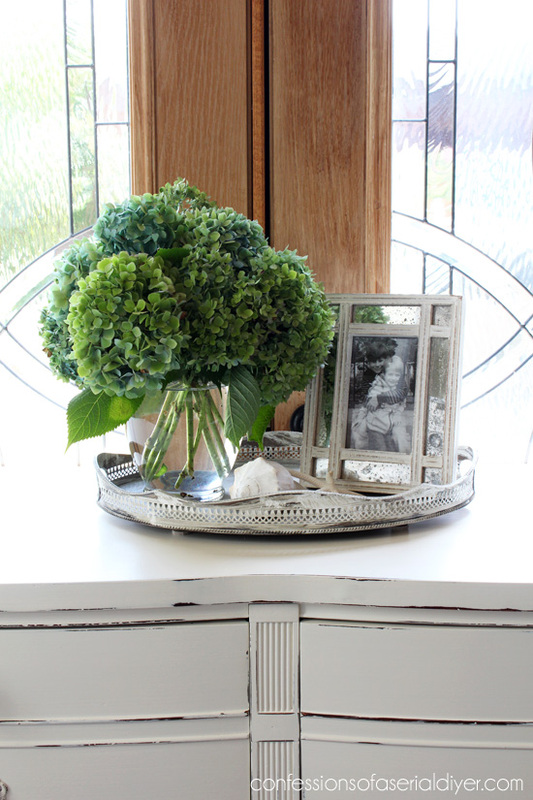 I’m hanging onto my hydrangeas as long as I can! I love the three different drawer papers! Can’t wait to read your step-by-step. 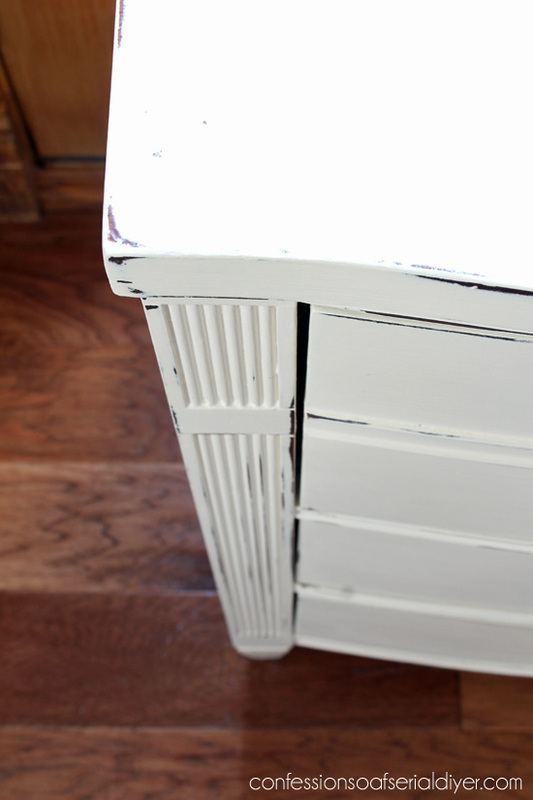 LOVE the dresser….good trick for when a knob is missing!!! Like it better that way! WOW!!!! to those hydrangeas!!! Beauties!!!! Love them in the green stage of life. I am going to sneak out from California and snip-snip some of those!!!! I inherited my mom and dad’s mahogany bedroom furniture, which we have been using for years. It is exactly the same style, but with a little different hardware. 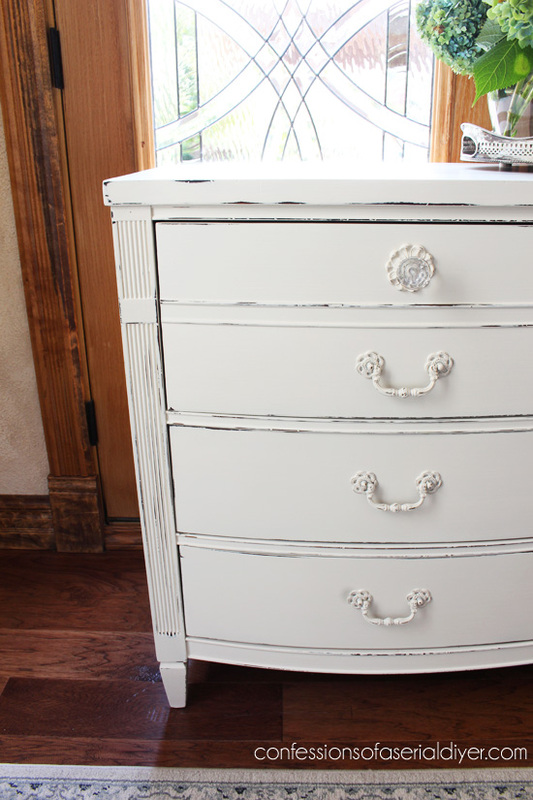 I have the same dresser, a highboy, and a nightstand, and have been trying to get up the guts to paint them. I’m also trying to decide whether to leave the top stained and paint the rest or paint it all. Any thoughts? Can’t wait for your how-to post! Absolutely gorgeous piece Christy! 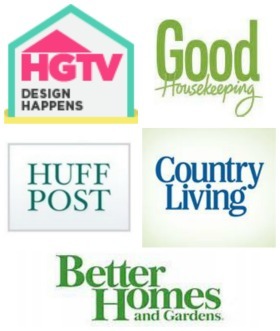 I’m looking forward to learning all your secrets in the step by step post!! Love Love Love all the special little details you put into this piece! It is so pretty! Well Done!